Portable frequency meters are designed to count the continuous wave signals transmitted from two-way radios (Source). They are frequently employed by maintenance professionals as well as hobbyists to test and detect frequencies and signal strengths (Source). The 9.3 oz., Surecom SF401 handheld frequency meter is our top pick- it includes a screw-in antenna, color display and rechargeable battery. 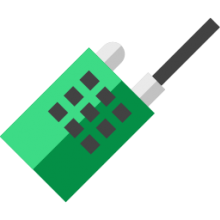 It can pick up frequencies ranging from 27Mhz to 3,000 MHz. Buyers commend the design and robust feature set. Some said there were some complaints regarding its sensitivity- but that is adjustable within the menu. It ships with a UHF Antenna, a USB charger cable, and a 100-240 Volt USB AC adapter. All that said, this is a solid and comparatively inexpensive handheld wave signal frequency counter that's received quality buyer feedback. Let's take a look at five of the best-selling ​​​​​radio frequency handheld meters on the market today and see how they compare. This portable frequency counter is a handheld frequency meter that has the ability to measure the exact parameters of the frequency of most continuous carrier signal walkie-talkies. The SF401 Plus Frequency Counter Meter gives the user easy ranges they can choose from- these ranges cover nearly all the frequencies of most two way radios that they might want to measure. This frequency meter has an easy four-button control system that is extremely easy to use. It is very compact so the user can take it anywhere it might be needed. This digital frequency counter weighs just 8 ounces and is only 2.3” x 1” x 3.1”, making it easy to fit in the palm of your hand. The auto power-off feature of this frequency meter can be set from 1 to 9 minutes giving you enhanced control. Those who have bought this handheld frequency counter have discovered that the product works well- as long as you use the right antenna for the frequency that you are trying to capture. 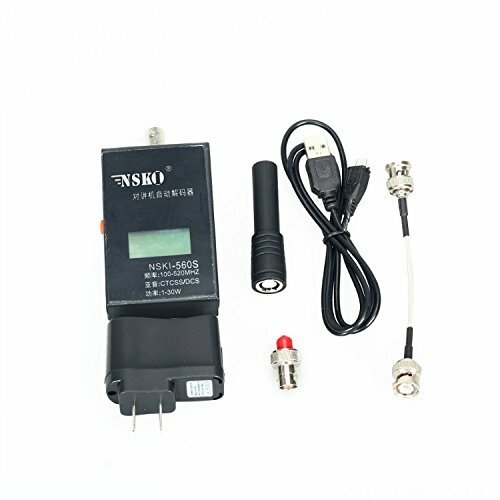 Users have said that this frequency meter works great with UHF but not so good for VHF nor does it do well for WiFi signals. This frequency meter is a professional-quality meter that comes with a variety of nice features- such as an easy-to-read LCD screen with a 9-digit display, a low power indicator, a built-in rechargeable battery, a decently intuitive menu setting, a signal strength indicator, an automatic back-light, and an auto switch-off to save on battery use. The Signstek Portable Frequency Counter is used for counting the continuous wave signals that come from two-way radios and has two different ranges. One range is 50MHz to 2.4GHz , 50 ohm and 10Hz to 100 MHz, 1 Meg ohm. This digital frequency counter is very compact measuring just 6.3” x 2” x 0.8” and weighs only 5 ounces so it’s easy to take with you anywhere you need it. It’s probably not the most sophisticated frequency counter on the market, but if you are on a budget this could be what you’re looking for. Buyers commend its ability to automatically save readings in memory storage- endorsing its capacity to process two-way radios, car remotes, and general radio-frequency snooping. Users do say that the supplied antenna has a narrow band that primarily will detect the strongest signal that is in range- sometimes you will need to use a custom front-end filter to specifically detect signals you are going after. The consensus coming from most users of this Signstek frequency meter is that for the price it does what it claims it can do. The majority of those who purchased the unit like it’s compact and lightweight size and how easy it is to read and use. However, some have warned that the instructions that come with the unit are incorrect- stating the buttons on the product don’t match the functions in the manual. 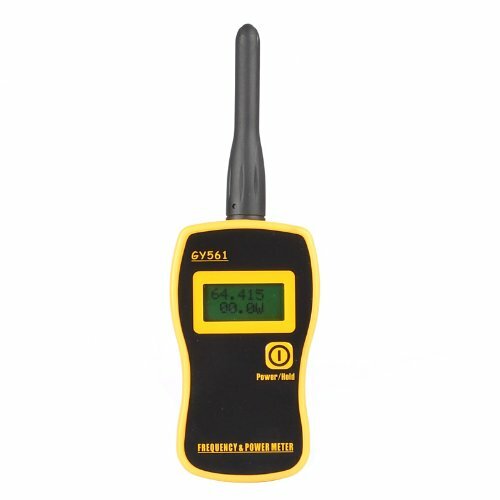 This radio frequency meter is a handheld RF counter that will continuously test analog radio signals for handheld radios, wireless phone signals and more. It also will work for digital radio signals, as well. It easily displays the frequency parameters along with the signal strength of what you’re measuring. The NSKI Handheld Portable Frequency Counter/Meter has a testing range of 100 to 520MHZ. It is simple to use- shipping with a one button control system that controls all the different functions of this frequency meter. 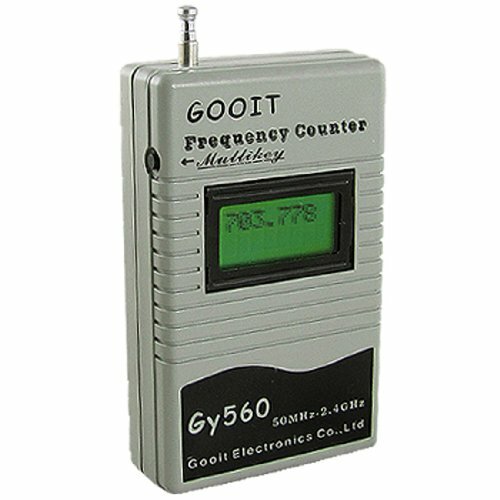 This portable handheld frequency counter weighs 8 ounces and measures 5.5” x 3.4” x 2.2”, so it’s a good size for mobile technicians and easy to take wherever you might need it. If you are looking for an entry-level, inexpensive frequency counter- this might be a solid option. 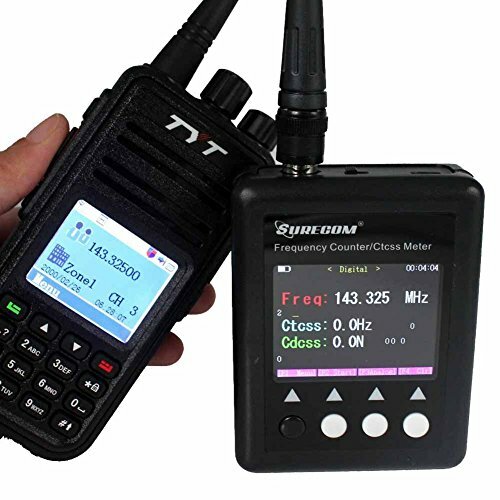 Some people who have purchased this portable frequency counter have noted that even though it is accurate for various frequencies and CTCSS codes, it is pretty unreliable for any DCS codes. Other users have noted that you need to be really close to measure any radio that has low power or it can’t pick up the frequency to measure it. This is a portable frequency counter that is made to continually test both analog ad digital radio signals. It’s a frequency meter that was made to be used as a tool for signal testing and for radio maintenance. The Gino Portable Handheld Frequency Meter has a testing distance of 8m for UHF and 5m for VHF and has a testing range of 50MHz to 2.4GHz. It has an antenna that pulls out and includes a one button operation system that works all the functions of this portable frequency counter. It’s very lightweight- weighing only 0.3 ounces and measuring 4.9” x 3.3” x 1.6”. Some who have purchased this handheld frequency counter have noted that they don’t like the build quality because it looks and feels cheap. The one button system on this frequency counter is not endorsed by users. It can be confusing and sometimes when trying to find the right function on the unit you just end up shutting the machine off. It takes several tries to get just what you want so one of the complaints most often noted by owners is that it is not easy to use. This particular portable frequency counter is one that is mainly used for measuring radio transmitting equipment like handheld radios or vehicle mounted radios. It is a frequency meter that both the output of power and the frequency. The GY561 Portable Frequency Counter Meter has an easy-to-read display with the ability to automatically convert power measurement ranges and can measure signals above 500MHz. It has an accuracy of 140-170/ 400-470 with better than 10% and the sampling time takes just 0.2 seconds. It’s a nice-sized unit that measures 5.8” x 5.2” x 1.9” and this frequency counter weighs 7 ounces so it’s easy to hold in one hand. The GY561 has great speed and this is one of the key features many users have rated it high on. But, at the same time, have complained that the antenna on this frequency meter is almost useless- and that if you are looking to find frequencies beyond 500MHz then this model is not for you. Most owners say it’s great for simple testing of analog radios but not reliable for digital testing. Individuals that purchased these highly portable frequency meters were generally interested in assessing the parameters of walkie-talkies with continuous carrier signals. Some of the common features that users prioritize when assessing the different wave signal frequency counters on the market are automatic off switches, automatic LCD backlights, integrated rechargeable batteries, removable antennas, low battery indicators and memory storage functionality. The way they work, is that you turn on the frequency counter by holding the on button for a second, switch on your radio, make sure that the two antennas are touching, then you'll hold down the transmission button for a few moments until you have captured the frequency. All of that said, check out our comparison table at the top of the page, read our individual product reviews, and click through to the individual product pages to get a sense of what other users who have purchased these frequency counters have said about their experiences with them.